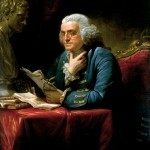 Benjamin Franklin was the American ambassador to France from 1776–1785. During the darkest period of the War of American Independence, Franklin, then living in Paris’ imposing Hotel Valentinois, (located at 4 rue de Basse, now rue Raynouard, Passy) adopted the pleasing custom of Sunday dinners to cheer his fellow countrymen. At about three o’clock in the afternoon on a bright, crisp Sunday in December, 1777, a select group of Americans graced Franklin’s table. Notwithstanding the sumptuous yet delicate dishes and the Bordeaux, Burgundy and Champagne that enhanced the meal, gloom governed the event. Reports had reached Paris that General Sir William Howe had taken Philadelphia. As a chaise-poste drawn by three horses dashed into the hotel’s courtyard, Jonathan Austin, a young Bostonian wrapped in a travel-worn fur coat, arrived to deliver urgent dispatches entrusted to him by the U.S. Congress. “Is Philadelphia taken?” asked Franklin. “Yes, sir,” was the reply. Franklin apprised the Court of Versailles with news of the American victory at once. He did so with such force and tact that the Count of Vergennes soon brought news that King Louis XVI had decided to recognize American Independence, offering a treaty with the United States within the week. Franklin’s Sunday dinners became a famed weekly feature of his administration. 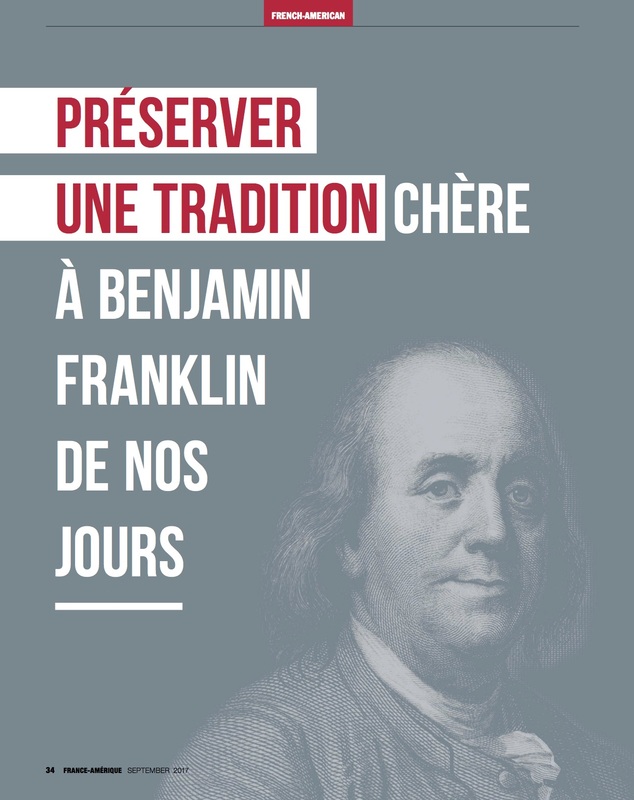 Indeed, Benjamin Franklin may be considered a true founder of the American Club of Paris. World War II led directly to the formation in New York of the Paris American Club. By the late 1930’s the large American business and professional colony in Paris was an established and integrated part of Parisian life. 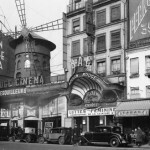 As the Germans advanced, Americans in Paris, reluctantly and sadly, began leaving for home; most settled in New York, and all were curious as well as heart broken about developments in Europe. In restaurants, on street corners, at private parties, whenever two Americans from Paris met in New York, they asked anxiously about their City of Light. A few Americans who had been Americans in Paris began meeting at the Brevoort Hotel in New York for lunch. Raymond Harper, an international lawyer, was the moving spirit but he sent out no announcements and made no phone calls, by word of mouth the news got around. At first there were five or six for lunch, then 10 or 12, soon 25 or 30. The New York colony that had once been the American business and professional colony in Paris wanted to remain in touch with itself and with France. The Paris American Club of New York was organized solely to realize that simple goal. In late 1940 the Brevoort lunches became, without much fanfare, the Paris American Club of New York. Dues were kept reasonable, Raymond Harper was elected President and agreement was reached to meet for lunch on the first Thursday of each month. That was about it. No constitution or bylaws were adopted; no membership qualifications were stipulated. As might be expected, some Paris American Club of New York members returned to Paris following its liberation and the end of World War II. Most did not, however, and the decision was reached to continue the club as a Franco-American institution of mutual regard and goodwill. The locale of the monthly meetings was shifted in the early days from the Brevoort to the Railway Machinery Club for a time because of its convenience for members with downtown offices. Over the years, Paris American Club luncheons have been held at the Lawyers’ Club, the old Ritz-Carlton Hotel, the Hotel Pierre, The St. Regis, the Parker Meridien, The Westbury, The Union Club, the Club at the World Trade Center (“Windows on the World”), the restaurants Le Régence in New York’s Hotel Plaza Athénée, Daniel, Le Cirque and La Caravelle. In the Fall of 1989, the France-America Society, established in 1911, merged with the Paris American Club. Inspired by these traditions, we are renewing the club so it may continue to promote French-American friendship for generations to come. Today, the Club’s membership is about equally divided between American and French government, business, professional and private individuals. Please join us!